A Mediterranean yacht charter transports you to a world of rugged landscapes, pristine beaches, cosmopolitan cities and quaint fishing villages. It’s a land as diverse as it is beautiful with its abundant sunshine and array of cultural sites. From Greek ruins and natural harbors to magnificent palaces and artifact-packed museums, the Mediterranean enjoys a well-established reputation as the center of the ancient world. However, with chic beach clubs, designer boutiques and an enviable culinary scene, this corner of the globe is equally comfortable with modern life. Chamberlain Yachts provides you with a wide choice of charter yachts for all Mediterranean destinations. The Mediterranean yacht charter season runs from May until October with July and August as peak season. However, events such as the Cannes Film Festival and Monaco Yacht Show ensure that traditional shoulder season dates are also popular. Whether you want to go island hopping in the Balearics, explore the nightlife of the French Riviera, or venture into the lush and mountainous interior of Corsica, Chamberlain Yachts provides yacht rental in the Mediterranean for all your holiday needs. The French Riviera is always in fashion and sophisticated celebrity hot spots like Saint-Tropez and Cap-Ferrat emphasize its timeless appeal. The Cote d’Azur officially launches the Mediterranean season with the Cannes Film Festival and Monaco Grand Prix, two glamorous events that are subject to international attention. World-class shopping and dining can be found along the coast in Monaco and beyond to even the smallest resort towns. Nice offers both substance and style with its atmospheric old town, cultural events and vibrant nightlife. When you tire of shopping and want to enjoy the jaw-dropping scenery, point your Mediterranean yacht charter in the direction of the medieval village of Eze, which is perched on a rocky peninsula; it’s an ideal place to drop anchor and swim in clear blue waters. Italy offers all you could desire with its amazing archaeological sites, sun-soaked piazzas and internationally famous cuisine. Start at the UNESCO status Cinque Terre (‘Five Lands’), an incredible stretch of coast in northern Italy where craggy cliffs contain stacks of pastel-coloured houses and terraced vineyards. Sail down to the Amalfi coast and eat at waterfront restaurants that offer spectacular sunset views across the sea. The volcanic Aeolian Islands offer a unique experience as does the inviting Bay of Naples and the upscale island of Capri. 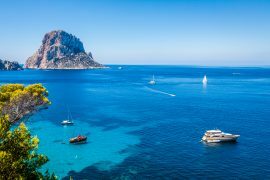 No yacht charter in the Mediterranean would be complete without a trip to the Spanish Balearic Islands, a diverse archipelago. 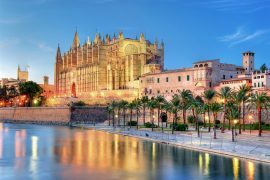 Mallorca is the biggest and suits all tastes with Palma’s historic town and a plush marina that is overlooked by a Gothic cathedral. The scenery along the mountainous north-western coast is rugged and blanketed with pine and olive trees. 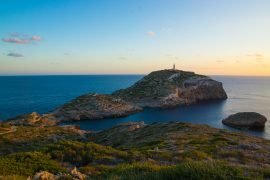 Ibiza is renowned for its super clubs and vibrant sunset bars but also has a secret quiet side of charming villages and Bohemian markets that celebrate art and traditions. The tiny island of Formentera makes a relaxing diversion and offers uncrowded Caribbean-style beaches. Greece is an ideal Mediterranean yacht charter destination for island hopping. Its 14,000km coastline and 6,000 islands are an explorer’s dream. Surrounded by waters that blend from the deepest blue to completely clear, Greece’s golden sand beaches, ruins, white sugar cube buildings and tavernas leave an indelible impression. Established in Fort Lauderdale in 2003, Chamberlain Yachts’ expert team specializes in yacht management services including both yacht charters and brokerage. We take care of all the bureaucracy and time-consuming issues that planning a Mediterranean yacht charter itinerary can entail. We have earned an unrivalled reputation for our ethical practices and high-level customer service. Chartering a yacht with Chamberlain Yachts ensures absolute peace of mind and a first-class experience. Please contact us to discuss how we can help you plan your ideal Mediterranean yacht charter. 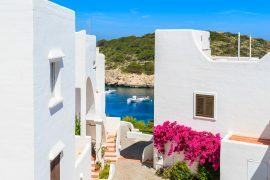 A unique combination of jet-set glamour and gothic grandeur, exciting nightlife and quiet anchorages, these Spanish islands are sun-soaked and stunning. 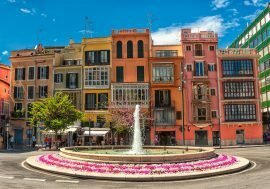 The medieval streets and cathedral of Palma mingle with chic shops, while Ibiza is all about nightlife and le club hot, but these islands also have prehistoric wall drawings and Bronze Age settlements. Away from the nightspots, you’ll find unhurried villages and a quiet lifestyle that is centuries old. Many of the best anchorages are in fjord-like calas-deep slashes into the islands framed by formidable cliffs that are often only accessible by water. The historic capital is Palma, which is readily accessible by air. Join your yacht, but save time to see the ornate cathedral and explore the shopping districts. Or you might want to visit the Cuevas del Drach (Caves of the Dragon) for an underground concert in natural theatre. A national park with a 14th century castle, there is just one anchorage and a permit is required to venture ashore, so this island remains off the tourist track. Take a spin on your yacht’s PWC or tender, and you may be joined by playful dolphins. Depart Cabrera after a leisurely dinner for an overnight crossing with a dawn arrival at your next stop. The smallest of the Balearics islands, Formentera, has been called “the last paradise in the Med” because it remains untouched, from its flawless beaches to the palms and pines on its shores. Visit the small town of Es Pujols for grilled seafood and fish soups. Ibiza is the party capital of the Med, with all-hours clubs filled to overflowing every night. Nicknamed the White Island for its whitewashed buildings, there’s more to this island for its whitewashed buildings, there’s more to this island than just the nightlife, however: Explore ses Fontelles cave with its Bronze Age drawings or Cueva des Cuieram, a cave with a Carthaginian temple hidden inside. Cala Portinatx, is a remote and calm harbor at the northern end of Ibiza has been a mariners’ refuge for centuries, with flawless beaches edged by forests of pine. 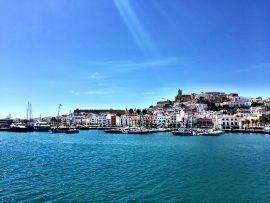 The complete opposite of busy Ibiza town, you can relax, enjoy your yacht, and frolic in the warm water. With one of the finest marinas in the Med, Perto Portals has developed into a luxurious destination on its own, boasting waterfront restaurants and an eclectic mix of shops and sights. Don’t miss Michelin Two-Star Tristan’s Restaurant overlooking the marina with a wine cellar to please even the most discriminating oenophile. 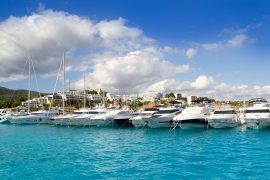 Depart your yacht after a short cruise to Palma. Either head for the international airport or spend time in the medieval lanes of this ancient city.